The theme for March's Diva Blog Hop is Embellish. 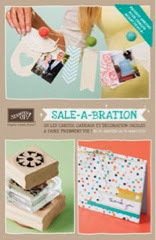 I chose to use supplies (stamps, embellishments and more) that are featured in the mini catalog. 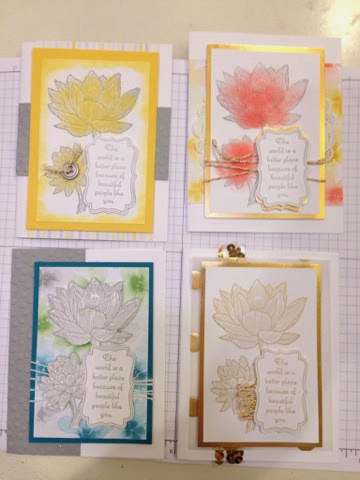 I wanted to do several cards using the same stamp set changing the layout just slightly. 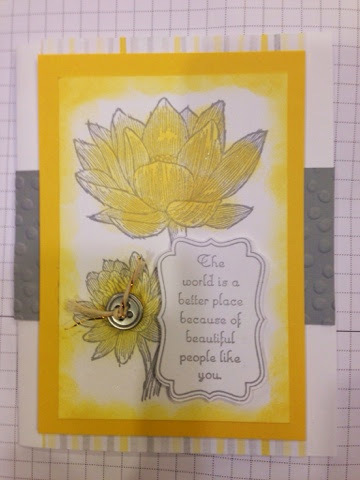 I like this simple stunning flower in the People Like You stamp set 133215. Plus the greeting is pretty universal "The world is a better place because of people like you. I love the Watercolor Wonder designer series print in this paper 132994. It really softens the card. 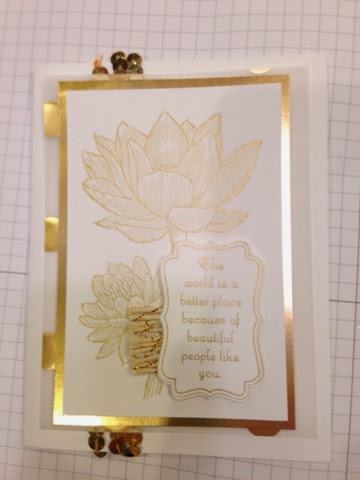 My embellisment on this card, is the gold twine 132975, label punch, paper doilies, and gold foil paper 132622. Changing things up a bit this card has a more vertical focus. 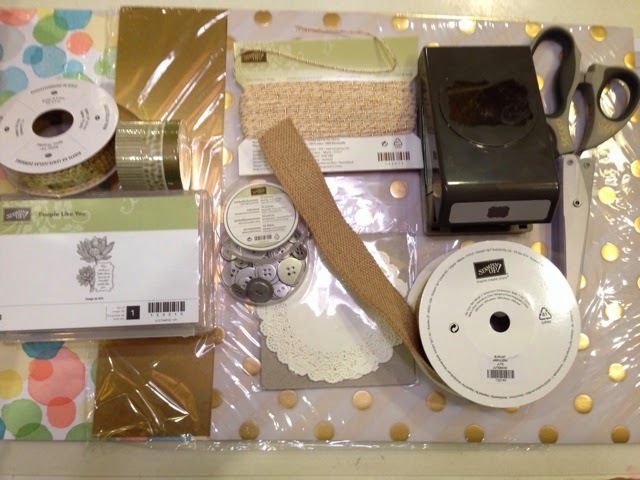 I used the gold bakers twine and metal buttons 133319, and label punch on the greeting. 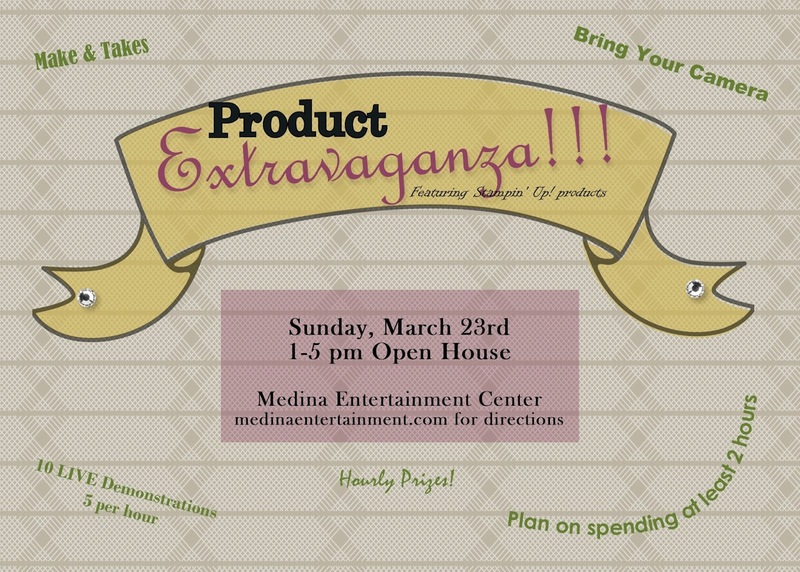 I also used an embossing folder found for FREE with a $50 purchase in the Sale-A-Brate catalog on the Smoky Slate piece. 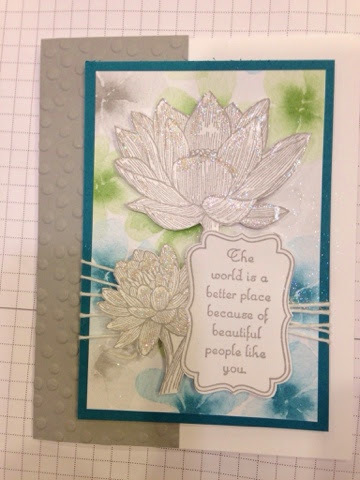 For this next card I used the Big Shot and embossing folder again. I used white bakers twine. And to pop the flower off the gorgeous watercolor paper I cut out the stamped flower and mounted it with dimensionals. 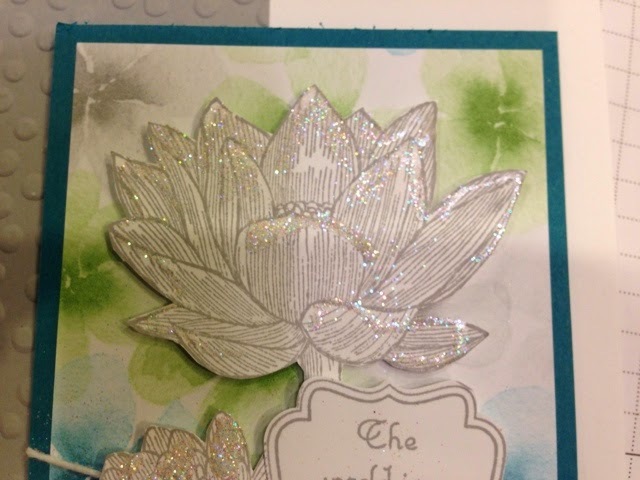 The card seemed to need a pop so I used two way glue and sprinkled on Dazzling Diamonds glitter. It gives the flower a glistening watery look. For my final card I had to try a gold and white card. Had to be done! 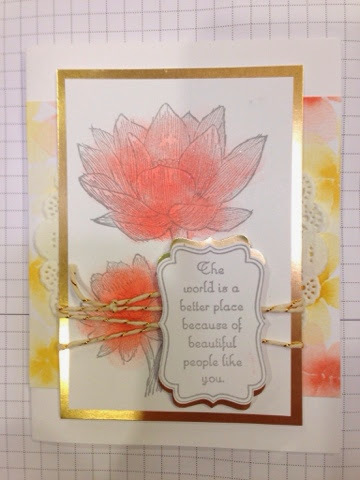 I stamped the flower in gold Encore ink. The gold patterned vellum paper 133363 gives a soft gold look when gold can be bold and bright. The vellum does soften things a bit. 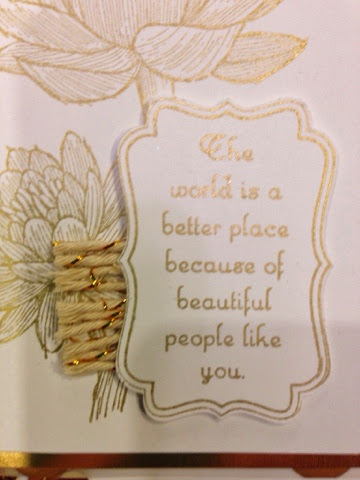 I used the gold foil paper again and some more of that gold bakers twine. I do NOT like the gold sequins 132983 and am having trouble using them. I reached out to another demonstrator to play with them and see what she comes up with using sequins. I tried to rip them off but it started to destroy my project. Just ignore the sequins. Thank you for stopping by for another Diva Blog Hop. Here are all the cards. I did not end up using all the supplies but had fun playing with the supplies I did use. This was my first time crafting in my office since my February 6th knee replacement. Its been real fun!!! Kat: http://www.instastamp.blogspot.com/. Not participating this month. Pictured is a small container of the special cream I have been using on my face in the last year. It is a modified recipe that I found on Pinterest. 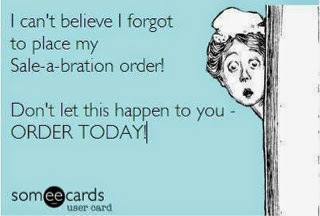 Gotta love Pinterest. Other than days I need sunscreen on my face, this is the only cream I use on face, around my eyes and elsewhere on my vast body. Lol. My ortho surgeon is very please with how well it healed my first knee scar. He thinks it looks amazing. His only recommendation was a little Vitamin E. Well mine does better than that. If you have been reading DIY blogs on going organic, making your own homecare products or your own health and beauty products, you see over and over to use organic coconut oil, which, when heated, becomes oil. At room temperature coconut oil's consistency is more similar to a nut butter, which is really what it is. 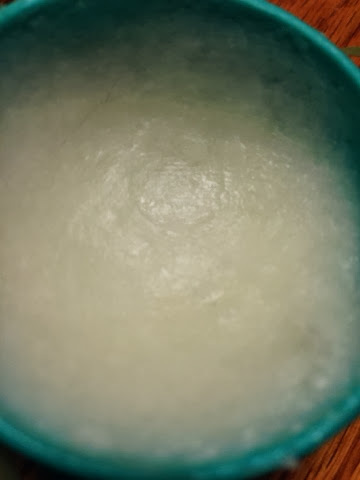 A year ago I decided to try a recipe found on Pinterest for coconut oil and vitamin E. I have had so many skin issues with irritation from various creams and lotions, some quite expensive and you hate to throw those ones away. I made my first batch. I wish I had taken a before picture, or after. But I didn't. Too shy. I had zero irritation. All eye creams used to make the skin around my eyes itch just a tiny bit. Never got relief from it. Now I had none. My skin was smooth and clearer looking after two-3 weeks. Tiny lines not visible. The magical lotion soaked into my skin rather than lay on top of it, like it felt so many other lotions/creams would do over the years. It does feel a little oily when you first apply, but soaks into the skin in about 10 minutes. When this batch ran out, I made a new one. And tweaked it. This time I added Evening Primrose Oil. I read that it helped reduce inflammation and puffiness under the eyes when taken internally and might help reduce those pesky black circles. I thought, if it works when taken orally and run through all that plumbing, what would happen if you just put it right on your skin? So I added some to my next magic lotion batch. Wow. It wasn't a really big wow but I could see a difference. It was a bigger improvement than I had seen from all my years of expensive lotions and potions. I have very little lines around my eyes for someone my age. My forehead lines have been there since grade school. Do not think they are going away without the benefit of Botox. Not going there. Not yet anyway. Call them expressive lines. I just express myself more than some people. Lol. Heat coconut in microwave safe bowl for just a few seconds. Snip the capsules with a scissors and squeeze the contents into the coconut. Stir until well mixed. I mix this into 3-4 small pots that used to contain the really expensive stuff. Refridgerate for a few hours to make solid again. Keep cold until ready to use that pot. Note: in the summer cool in refridgerator if it gets too oily and warm. The cool will feel great on your face. In the cold months of the winter, the magic lotion with be a bit thicker. You could add more capsules to thin it out or just keep your pot under a bedside light seems to be enough heat to thin it out. I am not bothered by the thickness. I find that if I grab a small chunk I can just smooth it out on my face. My husband has switched to this magic cream. My son so far just uses straight coconut oil. As a teenager though, when he uses it consistenly his skin is clear and breakout free. Please let me know if you make your own and how it went and any tweaks you made to the recipe. It really is simple and easy and lasts a long time. Costs pennies compared to my $55 pots of cream that didn't do the job and were only lasting about 7-8 weeks. Sad really the amount of money I spent. Will I go back to the expensive stuff? Maybe if there is a guaranteed cream for the deep forehead lines that have been there for many decades. What a difference a day can make. If you read my post yesterday (March 10, 2014) about my Scarred Journey you can see how beat up, scarred and ravaged my knee looked yesterday. This is my knee today. Looking more like a normal knee, as normal as it will ever look now. Happy dance. I was even able to lift it over the edge of the tub getting in. Getting out was a very different story. But that was more muscle contraction than I have had since pre-surgery. Yes, I cried. Relieved. Even if I do not get muscle contraction like that for another few days, it is an honestly good sign that the muscle will work. And contract enough for such a large movement as lifting the 18 some inches over the edge of the tub. I was just so happy I had to share with you. 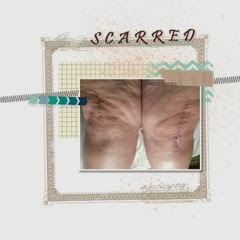 My special scar/face/whole body cream recipe coming. Maybe, just maybe, I needed more time to heal. Maybe it was the warm weather today and sunshine outside. Maybe things will move foreward now. I thought I'd share some of what has been going on with me the last six months. The journey is far from over. 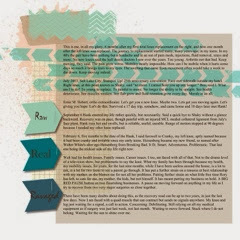 Since my scrapbook pages upload as tiny .jpegs here is the text on the journaling part. The rest of the page should be legible. This is me, in all my glory, 6 months after my first total knee replacement on the right, and now one month after the left knee was replaced. The journey to replacement started many, many years ago, in my teens. In my 40's the pair have been nothing but a headache and in an out of pain meds, injections, fluid removal, xrays and more. No new knees said the half dozen doctors I saw over the years. Too young. Arthritis not that bad. Keep moving, they said. The pain grow worse. Mobility nearly impossible. How can I be mobile when it hurts some days so much it brings tears to my eyes. The swelling that came from movement often would take a week to die down. Keep moving indeed. July 2013, Salt Lake City, Stampin' Up! 25th anniversary convention. Face met sidewalk outside my hotel. Right knee, at this point known as Shaky, said "no more. I cannot hold you up any longer." Boo, said I. What am I to do? To young to replace. To painful to move. No longer the ability to be upright. See health deteriorate. See muscles weaken. See flab grow and fluid retention grow every day. Morale and all. Enter M. Hebert, ortho extraordinaire. Let's get you a new knee. Maybe two. Let’s get you moving again. Let's giving you hope. Let's do this. Survived a 17 day trip, somehow, and came home and 10 days later met Hank! September 6 Hank entered my life rather quickly, but necessarily. Said a quick bye to Shaky without a glance backward. Recovery was on pace, though painful with an injured MCL medial collateral ligament from July's face plant. Hank runs hot and swells, but is reliable, useful, useable. Range of motion stopped at 90 degrees because I needed my other knee replaced. February 6, five months to the date of the Hank, I said farewell to Cranky, my left knee, aptly named because it had been cranky and irritable since my early teens. Heisenberg became my new friend, so named after Walter White's alter ego Heisenberg from Breaking Bad. It fit. Smart. Adventurous. Problematic. That last one being the stickier side of my life right now. Walt had his health issues. Family issues. Career issues. I too, am faced with all of that. Not to the drama level of a television show, but problematic to say the least. What my family has been through because my health, my mobility issues, for years, for the last nine months, while I have been useless around the house, is a lot to ask, is a lot for two teens to see a parent go through. It has put a further strain on a tenuous at best relationship with my mother, as she blames me for not all her problems. Putting further strain on what little free time Rory has left, to care for me, my mother, the kids, but not himself. It has meant putting my business on hold. A BIG RED PAUSE button on two flourishing businesses. A pause on moving forward on anything in my life as I try to recover from two very major surgeries so close together. There have been many doubts about doing this, as the recovery road can be up to two years, in just the last few days. Now I am faced with a quad muscle that can contract but sends no signals anywhere. My knee and leg just waiting for a signal, a call to action. Concerning. Debilitating. Still relying on all my medical equipment as if surgery was just last week, not last month. Waiting to move forward. Stuck where I do not belong. Waiting for the sun to shine over me.